There are many different types of natural disasters that occur in the world around us. They can be quite deadly and at the same time cause great damage to life and property. Many a times, these disasters leave their mark on the hit region that lasts for many decades. It takes a lot of time and energy to then recover from the calamity. The disasters we speak about are not all the same. Some of them are more destructive than others and yet there are some that can wipe out all the nearby population. Moreover, there are some that can be predicted accurately and others that are unpleasant surprises. In this article, we will look at two of such natural calamities, namely cyclones and Tsunamis. A system of winds rotating inwards to an area of low atmospheric pressure or a violent tropical storm is what we call a cyclone. On the other hand, a wave caused by an earthquake is what leads to a tsunami. Tsunamis have mostly commonly occurred in the Pacific regions in recent times whereas cyclones have occurred in various parts of the world. One of the main difference is that a cyclone can be predicted before it strikes but a tsunami cannot be predicted so it is hard for scientists to state whether a tsunami will strike a place or not. This implies that the damage caused by a tsunami is also greater as it cannot be predicted so no precautionary measures can be taken. Tsunami is a word that comes from the language Japanese and it means harbor wave. All the tsunamis are mostly the same with little difference in intensities. Cyclones, however, are of six types: Polar Cyclones that can be 2000 kilometers wide. They spin like Tropical Cyclones and they are formed in areas where there is less population so they are not too damaging. Then comes the Polar lows, whose horizontal length can be 1000 kilometers and it is a type of cyclone that is hard to predict. Extra Tropical Cyclones can produce thunder storms from a cloudy weather. There are the Subtropical Cyclones for whose formation, a mid–Tropospheric Cyclone is needed to cut the belt off the westerly in the east half of the north pacific. Then comes the Tropical Cyclones that cause strong winds and thunder storms. They get their energy by the evaporation of the water and are 4000 kilometer in diameter. Last but not the least come Meso Cyclones which are 2 kilometers to 10 kilometers and can cause thunder storms but are hardly too destructive. Another difference is that a cyclone is formed over water and develops by the wind whereas a tsunami is formed over the water and develops if there is an earthquake under the surface that is below the water. Cyclones can cause heavy rainfall which can in turn result in floods, pollution of water and loss of life and property. Cyclones are capable of thunder storms and extreme rise of water near the cyclone and can erode the vegetation, beaches as well as cause loss of life and property. Cyclones can cause strong winds which can damage trees and communication networks. On the other hand a tsunami is the most destructive force. The waves of tsunami can be up to 100 mph. It cannot be stopped and when a tsunami is formed, earth quakes of up to 28.0 can occur under the water! If you are in a boat far away in the ocean then the tsunami will not hit you but will go away under your boat. When a tsunami is formed the water is pushed upwards and it can destroy even the whole country. Moreover, a tsunami can also cause destruction to the countries nearby. Tsunami means a harbor wave and is usually the same with just variable intensities; there are 6 types of cyclones: Polar Cyclones, Polar lows, Extra Tropical Cyclones, Subtropical Cyclones, Tropical Cyclones and Meso Cyclones. allana. 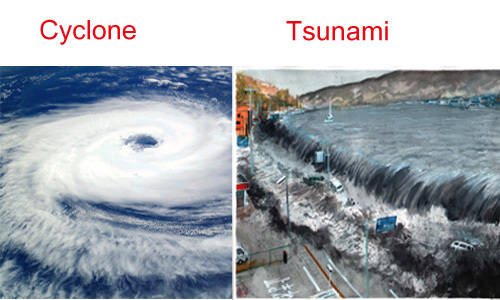 "Difference between Cyclone and Tsunami." DifferenceBetween.net. December 1, 2014 < http://www.differencebetween.net/miscellaneous/difference-between-cyclone-and-tsunami/ >.